Gabi Schillig (*1977 in Coburg) studied Architecture in Coburg and completed her postgraduate studies in Conceptual Design at the Städelschule - Staatliche Hochschule für Bildende Künste Frankfurt am Main (Class of Prof. Ben van Berkel, Prof. Johan Bettum and Prof. Mark Wigley) before founding her 'Studio for Dialogical Spaces' in Berlin in 2008. 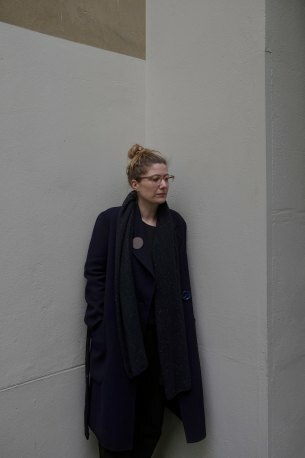 Gabi Schillig has exhibited internationally and received several fellowships and prizes, amongst others: Akademie Schloss Solitude Stuttgart (2007 - 2008), Van Alen Institute New York (2009), Nordic Artists´ Centre Dale (2010), Weissenhof Architekturförderpreis (2010), KHOJ International Artists´ Association Neu-Delhi (2011), Largo das Artes Rio de Janeiro (2015), Stiftung Bauhaus Dessau (2016), Nida Art Colony (2018) and HIAP Villa Eläintarha Helsinki (2019). From 2005 to 2007 she has taught Advanced Architectural Design at the Städelschule Frankfurt and from 2007 to 2011 in the Class for Space-Related Systems and Exhibition Design at the Berlin University of the Arts` Institute for Transmedia Design as academic associate. She has lectured in various international and interdisciplinary contexts. From 2012 to 2018 she was teaching as Professor for Spatial Design at the Düsseldorf University of Applied Sciences - Peter Behrens School of Arts at the Faculty of Design and has been the vice chairwoman of the Institute for Research in Applied Arts - IRAA (2015 - 2018). In 2016 she was constituted as a personal tutor by the Studienstiftung des Deutschen Volkes (German Academic Scholarship Foundation). In April 2018 she was appointed as Professor for Spatial Design and Exhibition Design at the Berlin University of the Arts at the Institute for Transmedia Design. In her artistic practice and teaching Gabi Schillig investigates contemporary and future questions of spatial design such as the relationship between space and body, the evolution of spatial systems, the potentials of materiality and the experimental use of analogue and digital design methodologies. Her conceptual approach results in multi-sensorial, dialogical structures and spaces of communication on multiple scales and in different contexts within spaces, cities and landscapes that lead to the emergence of an experimental spatiality that is based on social and physical processes and connect materiality and interaction in an immediate way. In my artistic practice, research and teaching I investigate contemporary and future questions and methodologies of spatial design - mainly themes that straddle questions of relationships between space and body, spatial communication, organization of analog and digital spatial systems, materiality and dialogical structures. The works become physical, multisensorial interfaces between bodies, spaces and landscapes that generate temporary - often irritating - situations between people and their environment. Performative and participatory strategies for spatial production generate a changing, multi-dimensional perception and understanding of space.